Pitch Coal-Fired Pizzeria is located on Underwood Avenue in the heart of Dundee in Omaha, Nebraska. Started in 2009 by restaurant entrepreneur Willy Theisen, Pitch has quickly become a favorite for many in the Omaha area. Pitch offers many unique menu items such as Calabrese meatballs (a must have starter), fresh green salads, coal-fired burgers and their delishious coal-fired pizzas. This past Sunday, we took a break from the College World Series and made the drive down to beautiful Dundee for dinner. After snagging a parking spot right on Underwood Ave. in front of the restaurant, we entered and were quickly shown to our table. It was early for dinner, but Pitch was already hopping with activity. The restaurant features a full bar, some community seating as well as plenty of seating for couples and larger groups. On weekends you can plan on waiting for quite a while at this popular Dundee eatery. Tonight we decided on a roasted beets salad, the Mia pizza and the special pizza of the night: roasted chicken with house-made pesto. 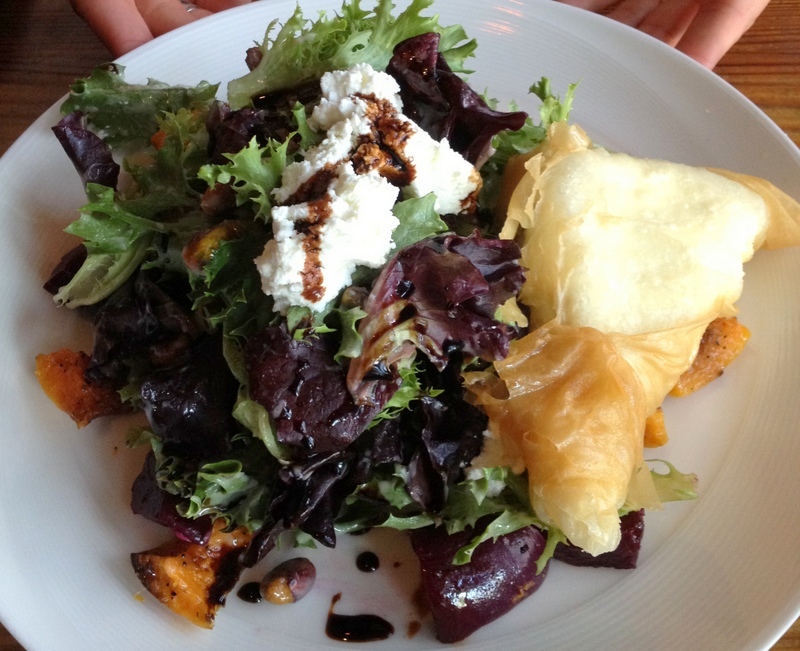 The salad was a delightful combination of fresh greens, red beets, and pieces of roasted butternut squash. It was topped with a red wine vinaigrette (the perfect amount- some restaurants get heavy handed with the dressing) and a few chunks of goat cheese. Speaking of goat cheese, if you love goat cheese (as The Pizza Wife does) then get this salad. It comes with a large triangle of phyllo dough stuffed- and I mean STUFFED- with creamy, tart cheese. The Wife was in heaven. 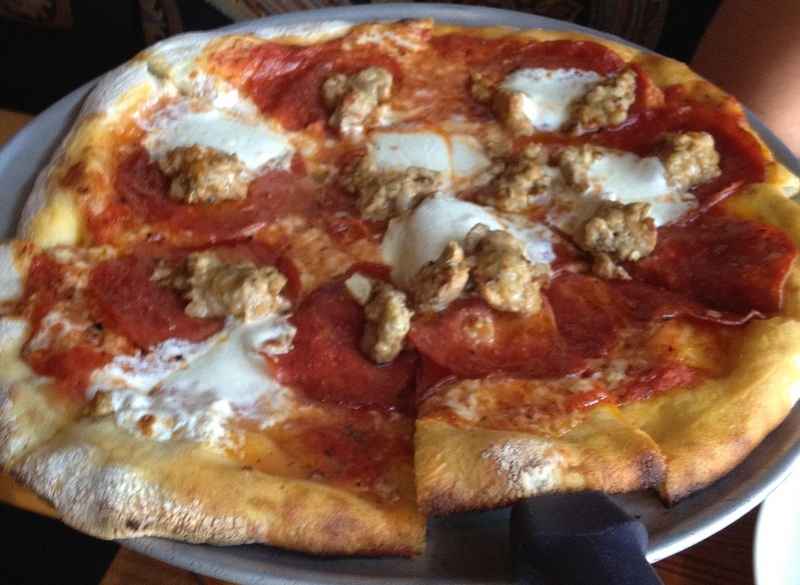 The Mia pizza, which is described on the menu as Willy’s favorite, features San Marzano tomato sauce, big chunks of fennel sausage, large slices of pepperoni, and fresh mozzarella. All of this is piled on top of their crispy yet chewy and lightly charred thin crust. I found the tomato sauce to be nicely seasoned, sweet and plentiful – which was nice. All too often it seems the sauce is somewhat of an afterthought and used very sparingly. The pizza here had what I would consider to be just the perfect amount. 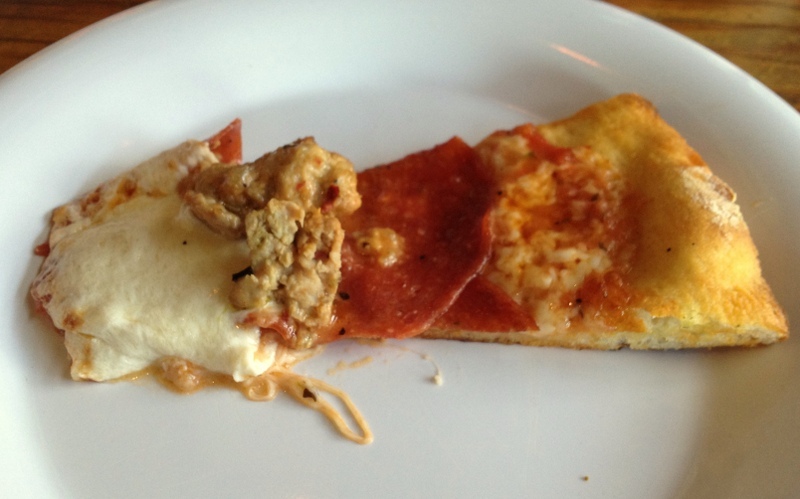 The sausage and the pepperoni were phenomenal. The large chunks of sausage were quite tasty and had the perfect amount of kick for my tastes. It was leaps and bounds above some other places that use prepackaged and precooked sausage pellets. Their sausage is freshly made and full of flavor! The hub cap sized slices of pepperoni where equally tasty and spicy. There were not one, but two layers of cheese on this pie and that’s always a winner in my book. One layer below the toppings as well as some nicely melted chunks of fresh mozzarella on top. 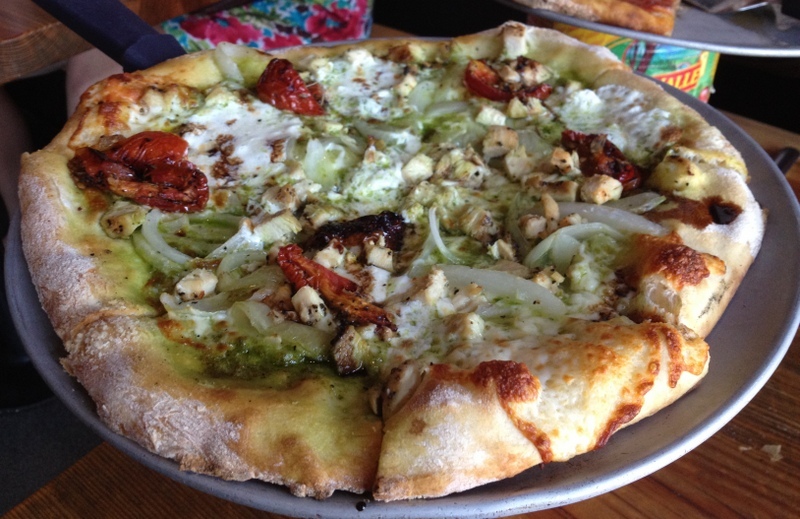 The special pizza of the night was roasted chicken with house-made pesto, caramelized onions, roasted tomatoes, fresh mozzarella and a balsamic reduction. It was certainly one of the better looking pizzas we’ve ever seen (the table next to ours even added it to their dinner order once they spied it). Unfortunately, we were disappointed in a couple of areas. 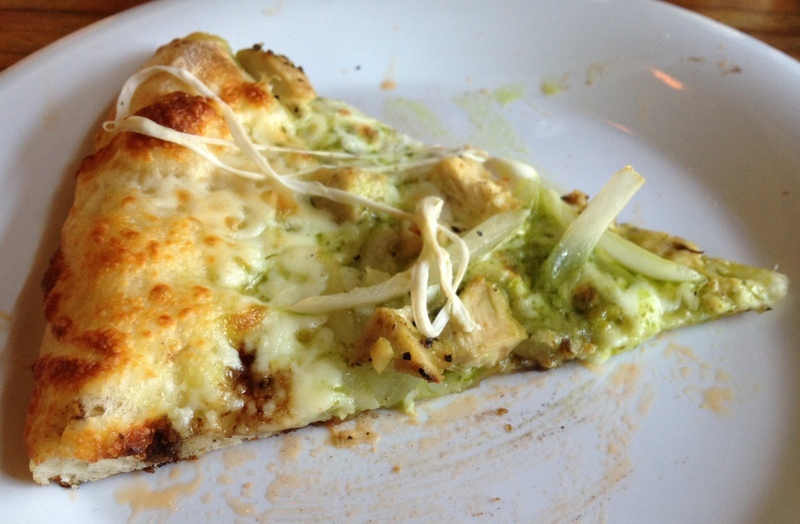 We felt the pesto was a bit bland and would have benefited from just a smidgen more garlic. Also, the onions weren’t our definition of caramelized. They looked like they may have been sauteed before being added, but they didn’t have the sweet, caramelly taste of the caramelized onions we’ve had in the past. On a high note: The Pizza Wife really dug the roasted tomatoes and thought they made the pie. They added a delicious note that complimented the rest of the toppings. 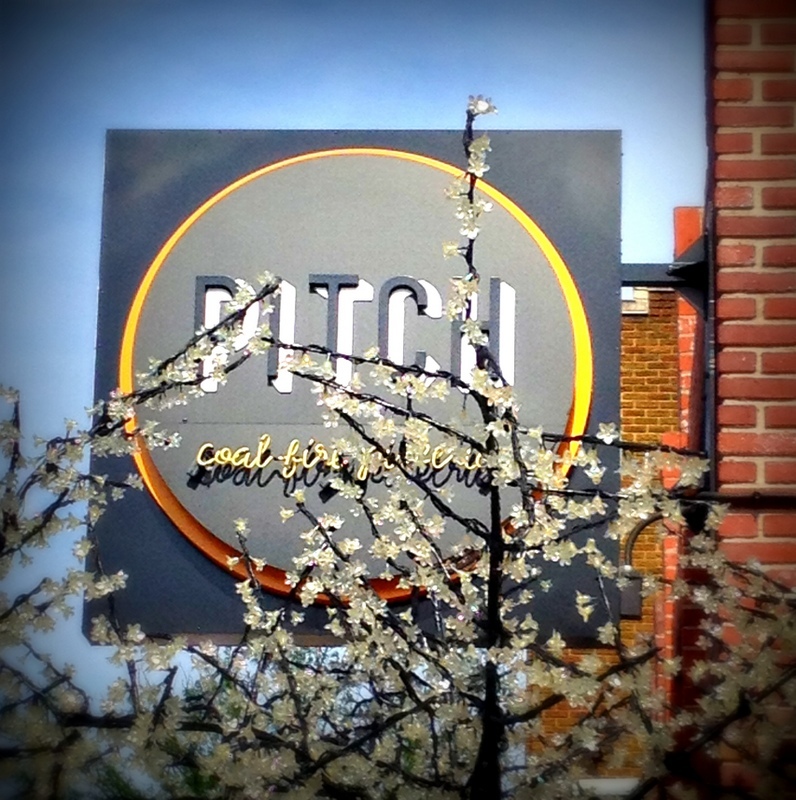 Overall we really enjoyed our visit to Pitch Pizzeria and we certainly recommend a visit to our readers. It seems that Willy has yet another winner on his hands with Pitch, and as a recent article in Omaha Magazine states, he has plans to bring the Pitch brand to more cities soon. This wasn’t our first night at Pitch and it certainly won’t be our last. We’ve enjoyed everything we’ve ever ordered here and tonight was no exception. Just be aware that when the place is busy, it can be more ‘bar-like’ and noisy, which could certainly turn people off if they are expecting a nice quiet meal. How would you rate Pitch Pizzeria? Click on the stars below! 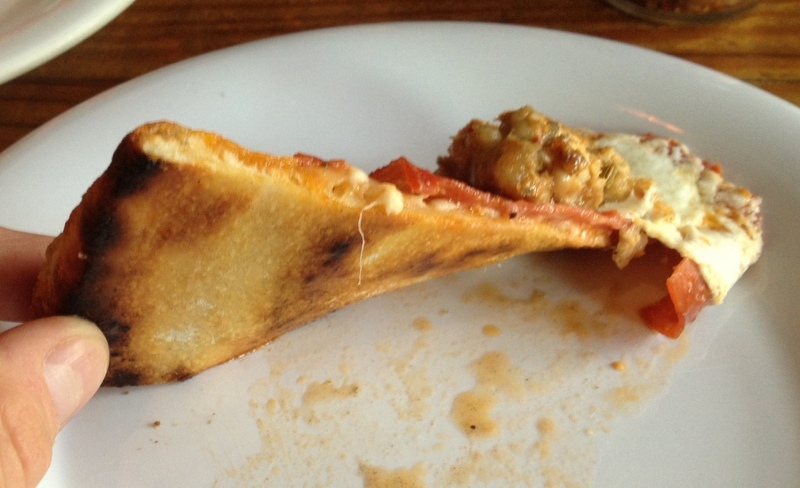 This entry was posted in Pizza and tagged Pitch Coal Fired Pizzeria. Bookmark the permalink. My favorite pizza. Lots of variety here. I recommend the two peps.